Are you fond of listening to music while taking a relaxing bath? But do you have to be satisfied on your own bathroom songs? Here is a wonderful product which will grant your wish of having a dream musical bath! Do you know what it is? It is a floating bubble – a waterproof Bluetooth speaker with fantastic sound quality which will make you feel having bathing out in the Nature, in a river, under a fall, with open sky above, when you will play your favorite, mesmeric music on it and let it float in your bathtub! This is Slive S-Bubble! 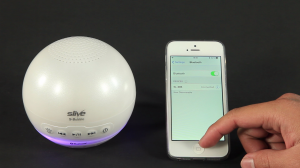 Slive S-Bubble is a Bluetooth speaker which can float in the water in your bathtub. Being waterproof, it is absolutely safe in the water. This is an innovative product and perhaps hardly anyone might have thought about this type of product. You can also use S-Bubble as Bluetooth shower speakers. Slive is proud upon developing this product because by now they are the only one to create such a product. If you want to close your eyes and get lost in the magical tunes all the time while you are bathing, you can do that. But you, rather your child, can also enjoy the S-Bubble because of its cute LED which spreads colorful light in your water and make your bathing experience bright and colorful! So, if you are enticed enough with the wonderful S-Bubble, contact SliveDirect.com and bring home your musical bath tool which will delight you and your family! Slive is an electrical engineering company with an impressive background and strives to create the best portable gadgets for the solutions of emergencies and disasters. They are aimed at creating eco-friendly and high quality products that can help people in unforeseen and unexpected events.